Is DBB still worth buying? Click here to see the Top 3 best performing ETFs right now. I am interested in ETF’s, and am wandering if you cater for European ETF’s, as International ETF and Bonds, and if I could get a list of your ETF’s. Reza, we only recommend US traded ETFs but many of them track International markets and bonds. I am not sure what ETF list you are referring to? So far the FAS had a 3x better performance than the DBB in Jan. 2010, …. FAS was up around 14.5% YTD from around $76 on Monday (Jan. 4) to above $87 on Thursday (Jan. 7). FAS is a 3x leveraged ETF. We do not recommend leveraged ETFs. 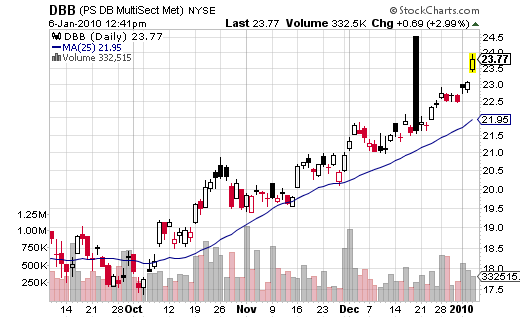 Bob, the “Best ETF of the Month” it’s a free service and we do not issue a sell signal for it but our subscribers get buy and sell signals for all ETFs we recommend. How did your signals do in 2010? How did your signals do int 2010? Can we get your personal interpretations of where you think the market is going short and long term? John and Daniel, we have some problems with the performance tracking software. As soon as this will be fixed the number will be updated. Daniel, I personally think that what we see now is just a countertrend in a long term bear market.